From the Department of Neurology and Focus Program Translational Neuroscience (FTN), Rhine Main Neuroscience Network (rmn2), University Medical Center of the Johannes Gutenberg University Mainz, Germany. Objective To describe a case of glial fibrillary acidic protein (GFAP)α immunoglobulin G (IgG)-associated encephalitis in a patient referred to us with MS on daclizumab treatment and to summarize characteristics of 5 additional recent German MS cases of serious encephalitis along with a previously published American case of CNS vasculitis associated with daclizumab. Methods Evaluation of cause, clinical symptoms, and treatment response. Results The 6 patients included 4 women and 2 men. The median age at onset was 38 years (range 32–51 years). Clinical presentation was marked by progressing neuropsychologic and/or neurologic deficits. Additional drug rash with eosinophilia was seen in 3 patients, whereas 2 patients showed a highly active demyelinating process. Examination of CSF samples detected pleocytosis, elevated total protein levels, and GFAPα IgG antibodies, which were not found in serum. In our case, we discovered autoimmune GFAP astrocytopathy associated with encephalitis as secondary autoimmunity, which was steroid responsive. Clinical outcome of other cases was marked by partial recovery in 4 patients and persistent foster care in 1 patient. Conclusions Our case of GFAPα IgG-associated encephalitis along with 12 other cases of serious inflammatory brain disorders following daclizumab treatment so far indicates that interfering with NK cells and Tregs by anti-CD25 antibody therapy can result in severe secondary CNS autoimmunity in man. The antibody daclizumab (Zinbryta; Biogen, Cambridge, MA) inhibits the interleukin 2 (IL-2) signaling pathway by blocking the IL-2 receptor α (CD25). 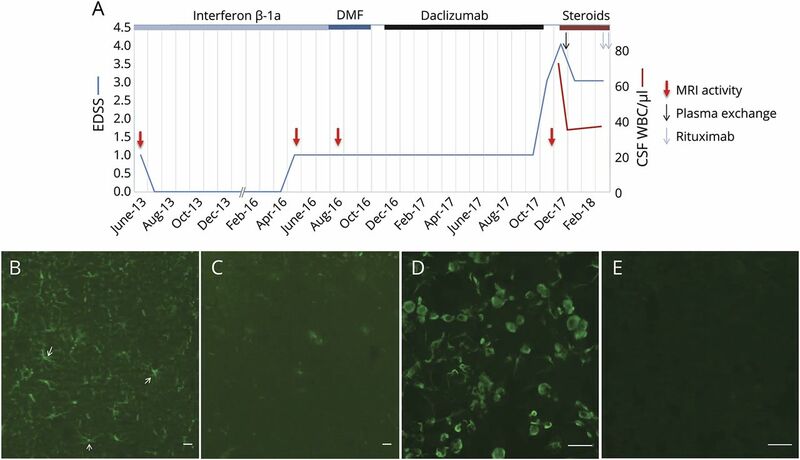 In clinical trials, daclizumab had proven to be an effective therapy for patients with relapsing-remitting MS (RRMS).1 However, recently, the use of daclizumab in MS was overshadowed by safety concerns associated with secondary autoimmunity. We here report the occurrence of steroid-responsive glial fibrillary acidic protein (GFAP)-mediated encephalitis in a patient with MS receiving daclizumab together with a series of other severe autoimmune CNS adverse events. We describe a 32-year-old Caucasian man with the first onset of RRMS in 2013 presenting with sensory spinal syndrome below thoracic vertebra (Th) 7. MRI scans showed disseminated cerebral and spinal lesions including 2 asymptomatic contrast-enhancing left parietal lesions. Analysis of CSF showed pleocytosis with 14 white blood cells (WBCs)/μL (100% mononuclear cells) and the presence of oligoclonal bands. Differential diagnoses were tested for and thus ruled out. The diagnosis of RRMS was therefore made according to McDonald Criteria 2010. Treatment with interferon β-1a (Avonex; Biogen, Cambridge, MA) was initiated. Because of clinical and paraclinical disease activity, therapy was escalated to dimethyl fumarate (Tecfidera; Biogen, Cambridge, MA) in September 2016 (figure 1A). Because of gastrointestinal side effects under dimethyl fumarate, daclizumab therapy was started in December 2016. The recommended blood examinations were uneventful. (A) Upper row: FLAIR axial images show progressive white matter lesions without contrast enhancement and distinct cerebral atrophy. Middle row: T1Gd-weighted images show no gadolinium enhancement. Lower row: T2-weighted sagittal images. A prominent radial pattern within T2-weighted axial pictures resembles a previously published patient with glial fibrillary acidic protein meningoencephalitis with a radial pattern of periventricular gadolinium enhancement. (B) T2-weighted sagittal images before daclizumab therapy and during encephalitic illness. T2-weighted axial image shows new focal gliosis at Th 3/4. FLAIR = fluid attenuated inversion recovery; Gd = gadolinium; Th = thoracic vertebra. In August 2017, the patient demonstrated aggressive behavior and occasionally expressed suicidal thoughts. Because of fluctuating dysarthria, progressive memory loss, fatigue, and depression, the patient was admitted to our hospital in December 2017. On initial examination, the patient was afebrile and demonstrated perceptive impairment, confusion, incoherent thoughts, and delusions. Neurologic examination revealed ataxia and nystagmus. His blood tests and differential blood count were normal. Lymphocyte subset analysis revealed values within the range of untreated patients with RRMS.2 The MRI scan showed a new juxtacortical right frontal lesion and a new focal gliosis at Th 3/4 (figure 1B), both without contrast enhancement. Electroencephalography showed moderately severe encephalopathy with generalized theta activity. A lumbar puncture revealed 74 WBC/μL (100% mononuclear cells), a CSF protein level of 61.5 mg/dL, and a CSF lactate level of 2.7 mmol/L. Oligoclonal bands and intrathecal immunoglobulin A (IgA) synthesis were present (figure 2A). Diagnostic tests (detailed in Supplement, links.lww.com/NXI/A60) did not disclose any infectious agent. Immunostaining of rat hippocampal tissue exhibited GFAP immunoglobulin G (IgG) antibodies in CSF (figure 2B, diagnostic laboratory of Euroimmun AG; Lübeck, Germany). GFAP antibodies could not be detected in serum (figure 2C). Antigen specificity was further confirmed by GFAPα-transfected HEK293 cell-based assay. Patient GFAP-IgGs reacted with GFAPα isoform (figure 2D), whereas no reaction was observed on control-transfected cells (figure 2E). (A) Disability assessed by the EDSS is displayed as a blue line. Clinical relapses and MRI activity (red arrows) are indicated. Duration of immunomodulatory treatments is depicted with lines of different colors on the top of the diagram. (B) Distribution of patient CSF IgG (green) in the rat hippocampus parenchyma is consistent with astrocytes (arrows). (C) Absence of specific patient serum IgG binding (diluted 1:100, green) in the brain parenchyma. (D) Antigen specificity of CSF IgG was further confirmed by glial fibrillary acidic protein α-transfected HEK293 cell-based assay CBA. (E) Absence of CSF IgG binding on control-transfected cells. Scale bars: 20 μm (B–E). DMF = dimethyl fumarate; EDSS = Expanded Disability Status Scale; IgG = immunoglobulin G; WBC = white blood cell. Magnetic resonance (MR) angiography did not show vascular abnormalities, but it demonstrated a slight brain edema as volume increase in comparison to pre-MRI from 2016 (figure 1B). An additional 18F-Fluorodeoxyglucose (FDG)-PET scan revealed no evidence of tumors. Chest CT findings were normal. With a diagnosis of autoimmune GFAPα astrocytopathy, we started treatment with 1,000 mg methylprednisolone/d, followed by 5 courses of plasma exchange every other day. The patient gradually improved while methylprednisolone was continued with 100 mg/d orally and tapered over time. Neuropsychologic examination thereafter demonstrated ongoing impairment in all cognitive domains including attention span, attention selectivity, information processing, short-term memory, verbal and figural long-term memory, and executive functions. However, there were no incoherent thoughts or noticeable behavioral disturbances, no signs of depression, and no ataxia. 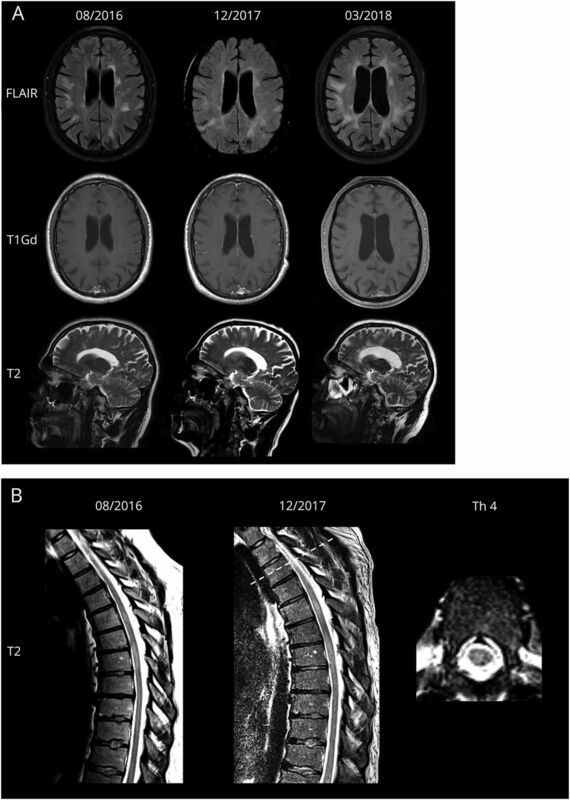 Despite the clinical improvement, the follow-up MRI in March 2018 showed, apart from a reduction in swelling, progressive non–contrast-enhancing white matter lesions with a prominent radial pattern, which resembles a previously published patient with GFAP meningoencephalitis.3 Follow-up CSF analysis revealed 39 WBC/μL, persistent intrathecal synthesis of IgA, but normal CSF protein and lactate levels. In the context of MRI results and persistent CSF pleocytosis under continuous steroid therapy, treatment with rituximab (MabThera; Roche, Basel, BS) was added. This led to a stabilization of the clinical status. Although neuropsychologic testing in general still showed significant deficits, the performance in some cognitive domains had improved. Currently, the patient is capable of participating in daily life activities again. Anonymized data will be shared on request from any qualified investigator. This report of a patient with encephalitis extends the spectrum of secondary autoimmune complications of daclizumab treatment by GFAP autoimmunity.3,4 GFAP-IgG autoantibodies are rarely found in CSF in healthy controls or patients with other diseases. A recent study using GFAPα isoform–transfected cells reported GFAP antibodies in 0 of 20 CSF specimens of MS patients.3 When detected in CSF, GFAP-IgG autoantibodies have been identified as a biomarker for a distinct spectrum of immunotherapy-responsive autoimmune CNS disorders.5 Anti–GFAP-IgG may occur alone or in the setting of other diagnoses, for example, anti-NMDA-receptor encephalitis or CNS vasculitis. Because one-third of cases with GFAP-IgG are paraneoplastic, neoplasia was ruled out in our case by FDG-PET. Because MS is ultimately a diagnosis of exclusion, there is a slight possibility that the primary pathology in this patient was a neuroinflammatory disorder other than MS. However, taking into account the relapsing-remitting disease course, the appearance of lesions typical in MS, the CSF findings in 2012, and the absence of anti-GFAP autoantibodies in MS CSF,3 it is most likely that the induction of GFAP autoimmunity is causally linked to daclizumab treatment. A limitation of our report is the lack of GFAP antibody investigation before deterioration on daclizumab treatment. Meanwhile, the European Medicines Agency (EMA) has received notifications of 12 other patients having severe encephalopathy syndromes following daclizumab therapy, 4 of those with fatal outcome. Among 5 German cases, 3 were suspected of drug rash with eosinophilia and systemic symptoms syndrome with CNS manifestation and 2 with highly active demyelinating process (data retrieved from Paul Ehrlich Institute, Federal Institute for Vaccines and Biomedicines, Germany). One American patient had CNS vasculitis6 (table). Cases of suspected secondary autoimmunity under daclizumab treatment have been previously reported including 2 deaths of study patients. In both cases (autoimmune hepatitis and psoas abscess), daclizumab treatment could not be excluded as a contributing factor.8,9 In 2017, the indication of the drug had to be restricted because of another death by liver injury that was most likely caused by autoimmune hepatitis.10 Moreover, the rare occurrence of autoimmune hemolytic anemia under daclizumab treatment has been reported in an extension study.10 After the recent EMA decision to urgently review daclizumab, in March 2018, marketing authorizations of daclizumab were withdrawn following twelve cases of serious inflammatory brain disorders, 4 of them with fatal outcome. In the 13th patient, who was referred to us, we discovered anti-GFAP encephalitis, which was steroid responsive. It has to be assumed that in man, disturbing the NK cell/Treg balance appears to be detrimental, even if the upregulated NK cells are considered as regulatory. F. Luessi and S. Engel: study concept and design, acquisition of data, and analysis and interpretation. A. Spreer: analysis and interpretation and critical revision of the manuscript for important intellectual content. S. Bittner and F. Zipp : critical revision of the manuscript for important intellectual content. This study has been supported by the German Research Foundation (DFG, CRC-TR-128 to F.Z.). F. Luessi served on the advisory board of Roche and received travel funding from Teva and Merck Serono. S. Engel reports no disclosures. A. Spreer received travel funding and speaker honoraria from Deutsche Gesellschaft für Liquoranalytik und Neurochemie and Institut Virion/Serion. S. Bittner received travel funding and/or speaker honoraria from Biogen, Merck Serono, Novartis, Roche, and Sanofi/Genzyme. F. Zipp received travel funding and consultation fees from Teva, Novartis, Merck Serono, Bayer, Biogen, Ono, Genzyme, Sanofi-Aventis, and Octapharma, consulted for DFG and PCORI PRAG-MS; and received research support from Progressive MS Alliance–BRAVEinMS, Teva, Novartis, Merck Serono, and Bayer. Full disclosure form information provided by the authors is available with the full text of this article at Neurology.org/NN. The authors thank Cheryl Ernest for proofreading and editing the manuscript. This study has been supported by the German Research Foundation (DFG, CRC-TR-128 to F.Z.). Ethical standards: All procedures performed in this case report were in accordance with the ethical standards of the institutional and/or national research committee and with the 1964 Helsinki declaration and its later amendment or comparable ethical standards. Informed consent: The patient was informed of the intent to publish the case report and gave his written consent. Accepted in final form May 31, 2018.
. Daclizumab HYP versus interferon beta-1a in relapsing multiple sclerosis. N Engl J Med 2015;373:1418–1428.
. Treatment response to dimethyl fumarate is characterized by disproportionate CD8+ T cell reduction in MS. Mult Scler 2018;24:632–641.
. Autoimmune glial fibrillary acidic protein astrocytopathy: a novel meningoencephalomyelitis. JAMA Neurol 2016;73:1297–1307.
. Clinical and immunological characteristics of the spectrum of GFAP autoimmunity: a case series of 22 patients. J Neurol Neurosurg Psychiatry 2018;89:138–146.
. Glial fibrillary acidic protein immunoglobulin G as biomarker of autoimmune astrocytopathy: analysis of 102 patients. Ann Neurol 2017;81:298–309.
. CNS vasculitis in a patient with MS on daclizumab monotherapy. Neurology 2013;80:453–457.
. Neuromyelitis optica IgG and natural killer cells produce NMO lesions in mice without myelin loss. Acta Neuropathol 2012;123:861–872.
. Daclizumab in multiple sclerosis: a high-yield extension study. Lancet Neurol 2014;13:443–444.
. Daclizumab (anti-CD25) in multiple sclerosis. Exp Neurol 2014;262:44–51.
. Long-term safety of daclizumab beta in patients with relapsing MS in EXTEND: interim results from treatment up to 6 years. Mult Scler 2017;23:64.